Wood Pellet Stoves and wood stoves are often considered together, as a potential alternative source of home heating. 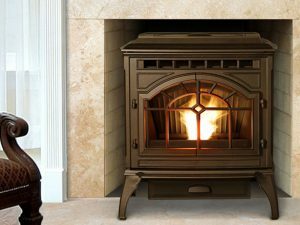 When deciding to buy a pellet stove or wood stove, there are several considerations that can come into play. a pellet stove installation can be easier and more versatile, because it can be vented out a side wall, whereas a wood stove requires a full chimney. If you are installing a pellet stove in place of an existing wood stove, the existing chimney can often be adapted to vent the pellet stove, making it an easy change out. Much like installing a wood stove, a building permit and inspection is required when installing wood pellet stoves in Ottawa Carleton. Our experts make this easy, no hassle process by providing all the required documentation and walking you through the easy process of permit application and inspection. In addition, when the pellet stove installation is complete, we provide a WETT certificate, which documents that the installation meets all installation requirements and codes, so you can rest assured it is done right. Pellet stove fuel can be easier and cleaner to deal with than wood, and pellet stoves are equipped with a hopper that typically holds 2-3 bags of fuel. Pellet stoves are typically attached to a thermostat, allow a better regulation of home heating and up to 3 days operation with one load of fuel, so they are somewhat more dependent on frequent reloading. Some wood pellet stoves are capable of using alternate “biomass” fuel, such as corn, grains, and even cherry seeds, but you will need to determine if the specific pellet stove model is capable of this. keep in mind that performance can vary with various pellet fuels. Pellet stoves come in a huge variety of styles, from modern to traditional, so installing a pellet stove not only provides great heating efficiency, but can be a great centerpiece to match any decor. Call today, and one of our experts will visit your home and provide a no obligation quote on the various pellet stove options available.You can see operational pellet stoves at one of our Fireplace Showrooms in Ottawa or Carleton Place. The Castile blends the best of the Old World with state-of-the-art engineering. Make it your own with unique finishing options. The powerful Classic Bay 1200 is one of the most proven and advanced heating appliances available. The new Mt. Vernon with Efficient Energy (E2) technology is the most powerful and efficient stove ever designed by Quadra-Fire. E2 technology helps achieve 81.6% efficiency. The Santa Fe is a smart, high-performance pellet stove with a small, contemporary shape. Eco-Choice PS35 medium-sized pellet stove combines dependability and value in a simple design. The Eco-Choice PS50 large pellet stove reduces your heating, delivering impressive heat with ease. Multi-fuel compatible – Tri-mode operating system – Large 1320 in2 heat exchanger – Dual chamber ash pan removal – Automatic controls. Automatic controls. – “Run Quiet” system. – Large ash pan. – Includes bolt-on hearth pad. – Tri-mode thermostat. – Large heat exchanger. European designed cast iron accents. Optional enameled panels in Racing Red & Classic Ivory – New “Comfort Level” system with internal thermostat. European designed cast iron accents – Large capacity pellet hopper – Heavy duty welded heat exchanger – Included hearth pad – Service indicator.